The Tuttle Draw Section of the 118 mile long Paradox Trail is located just north of Nucla, Colorado. The trail begins where the Paradox trail first crosses the Nucla-Delta Road and ends almost 4 miles later where the Paradox trail reconnects with the Nucla-Delta Road at a point that is about 2 miles closer to town. When the Paradox trail was rerouted to avoid a short trespass the Tuttle Draw section was created by adding some new stretches of singletrack to connect the already existing segments of old jeep roads in the area. 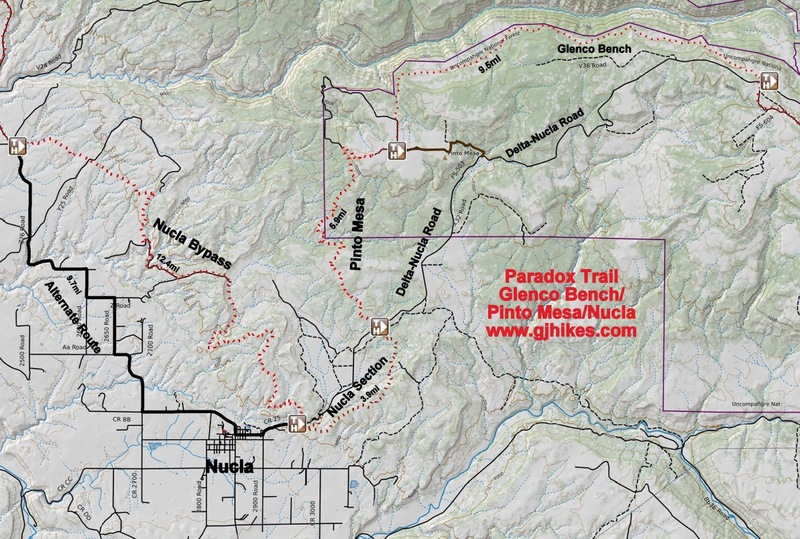 The Paradox trail crosses the 25 Mesa/Nucla-Delta Road about 4 miles north of town. There is some room to park after pulling off the road at the top of the trail plus a little room at the bottom of the trail. There is even more room to park closer to Nucla where the Nucla Bypass section begins. The trail starts out on a singletrack that quickly crosses an old road. There are cairns on both sides of the road that mark the route. As the trail continues there are also quite a few Paradox trail markers along the way. It is always reassuring to have confirmation that you are going where you were intending to go. 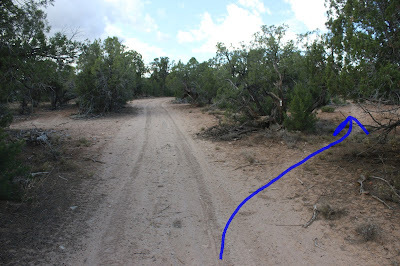 There are a spiderweb of old jeep roads in the area that were connected together by singletrack to create the new route so the trail alternates back and forth between double track and singletrack. The uphill stretches of the trail were constructed with mountain bikers in mind and only seemed moderately difficult. The trail meanders around enough that it travels almost twice as far as the Nucla-Delta Road to eventually get to the same spot. Going in this direction there is only about 307 feet of climbing while there is a total of 680 feet of downhill. Eventually the trail works its way over to a ridge where you can see out over the area towards Naturita. At this point the singletrack spills out onto a jeep road that it follows on up the hill. The hill is braided with jeep trails going in all directions but at present there are enough Paradox trail markers that route finding isn't a problem. Near the top of the hill the Paradox trail branches off on one more short section of singletrack that takes it down to another road. From there the rest of the way off the hill finds various jeep roads to follow. The Tuttle Draw Section reconnects to the 25 Mesa/Nucla-Delta Road about 2 miles north of town. From here the Paradox trail follows the pavement for a half mile before branching off on the Nucla Bypass Section. There is an alternate route that goes through Nucla and reconnects with the main route after 9.7 miles of paved and dirt roads. 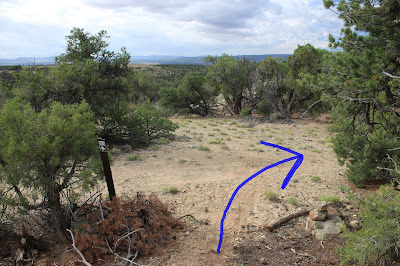 We thought that the Tuttle Draw section of the Paradox trail was fun enough that it could stand on its own as a separate trail that we feel people will enjoy popping over to Nucla for. Tuttle Draw was attached to it by us and isn't an official name but will do until something better comes along. If you would like to see it for yourself then all you have to do is grab your bike or 'Take a hike'.